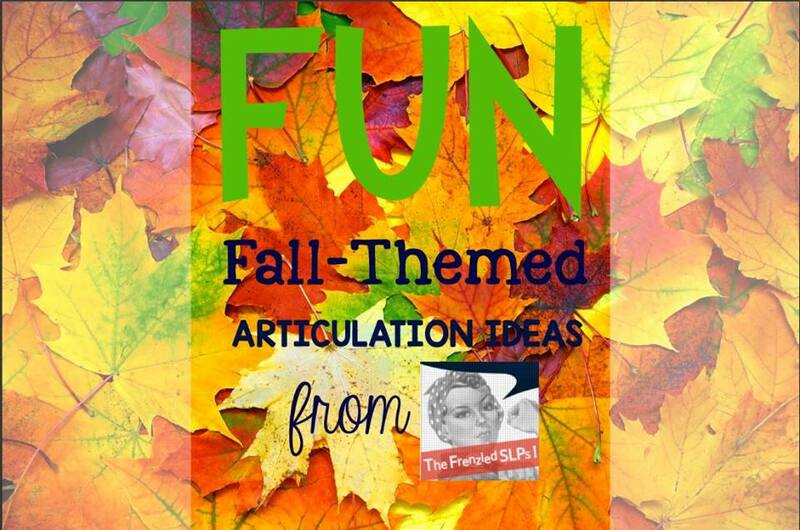 This month, for The Frenzied SLPs linky, we are focusing on fun, fall-themed articulation ideas. I love fall for so many reasons! I'm looking outside right now at a crisp, bright blue sky highlighted by trees that are just starting to show their fall colors. On this beautiful day, we are heading down to the pumpkin patch to pick out our pumpkins. The colors to me are what makes fall so amazing. I love the area that I live, just for the change of seasons! My students love fall colors too! In fact, they just love to color! 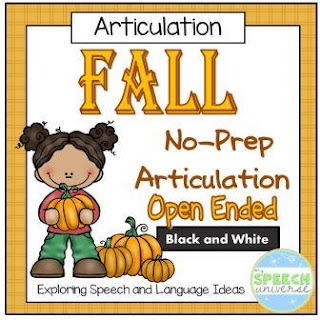 I made a Fall No-Prep Articulation packet to entice them to practice at home and with me. 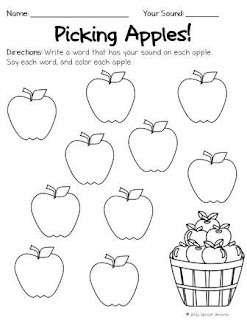 These are fun, quick, and simple sheets that encourage practice of any articulation target. There are pages for sounds in isolation, syllables, words, sentences, and a carryover page for discussion. I also included some extra sheets with ideas for words for each sound you may be targeting. These are nice to send home so that parents can help think of words to practice. You can hop along this linky hosted by The Frenzied SLPs to find many more great fall-themed articulation ideas. I love Fall, too. It's my season; no bugs, beautiful colors, cool temps, and apple crisp! These look great! The apple and acorns definitely make me think fall despite the 90 degree weather today in Texas! "No prep." Words to live by for a busy SLP! Thanks for the great post! Love this product!! Just so perfect!! Easy to fill out and great for letting parents know what's going on! I love open-ended activities. They let you meet lots of needs at the same time. Thanks! Love all of the activities to send home! I definitely love the no-prep activities too! The life of an SLP is so busy! No-Prep is my jam! The added word lists are a fabulous idea!